We can all appreciate a fresh blanket of snow and its beauty when the winter season is still young, but after having to clear off that fresh blanket everyday, it gets old really fast. Snow and ice also become an issue on our roofs, especially on older houses. Major ice formation along the edge of the roof are called ice dams. 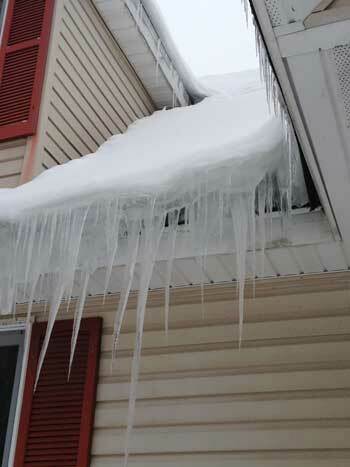 The ice dams are what cause giant icicles to form, which puts pressure on the eaves of the roof and the shingles. Ice dams are formed when heat escapes from the attic, which causes the snow to melt on the roof. The water then runs down the roof and refreezes on the edge of the eaves where the temperature is cooler. The dripping of water from the melted snow runs off the ice dams and eventually form icicles. All of this extra weight hanging off the house is not good for the eaves or the shingles, and all of the pressure and extra water can cause leaking inside the house. There are a few different easy solutions to keep ice dams from damaging your house. One of the simplest ways to keep ice dams from forming is raking your roof. This is not done with a rake you would use for leaves, or a regular snow shovel. 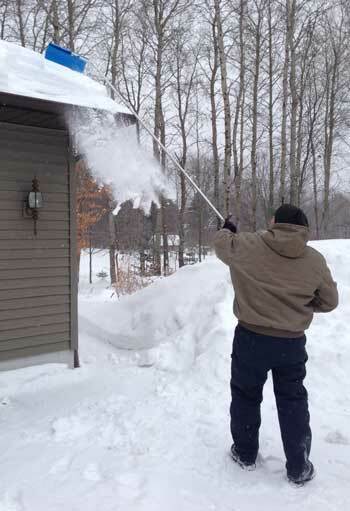 There is a special roof rake that usually extends 10-20 feet so you can easily reach the snow on most of the roof. Depending on the size and quality, a decent roof rake can be found for $30 to $50. These are very lightweight and easy to use, and they eliminate the need for a ladder. The best way to keep ice from forming when using a roof rake is to continuously keep the snow off the roof, and start as early in the season as possible. If there is just a light dusting of snow, there's no need to rake the roof. Several inches of snow is when it starts to matter. It would be best to rake the roof before shoveling the snow on the ground, to avoid having to shovel twice. To use the roof rake, simply start by raking the snow on the front most part of the roof, and gradually work your way back. Be careful in the process only to pull forward, and not to scrape backwards, which can potentially damage shingles by pushing against them. In the early process of ice dam formation, it may be safe to carefully break the ice off the roof before the ice builds up too much. Do not try this if the ice is very thick and has been there for a while; it clings to the roof and if the ice gets pulled off it can damage shingles and possibly pull gutters out of alignment. Removing ice is also hazardous and can present injuries to the one doing it. If the ice is too think to remove by hand, Roof Melts are great to pair with roof raking, because they help to create a path for the water to run off. Roof Melts look like a small white hockey puck, and can be thrown on the roof in several places to create a channel through the ice dam and snow for the water to run off. This way, water won't continuously drip into an icicle and build a bigger ice dam. In case you can't make it to the store for roof melts, but happen to have some calcium chloride ice melt for your sidewalks, you can fill the leg of an old nylon stocking with the ice melt to put on your roof. Lay the stocking vertically across the ice dam so it partially hangs off the roof. This will make a way for the ice to melt where the stocking is so the water can run off. You can put these in several different places where ice dams form to help see faster results. This creates a similar outcome to the roof melts. For a more permanent solution, ice dams can be avoided by applying small amounts of heat where they typically form. De-ice cable or tape can be applied to the edge of the roof so water will always have a place to run off without freezing and causing ice dams and icicles. This solution is more expensive than raking the roof and using salts, but it does not require constant attention like the other solutions. The cable is easiest to apply before the snow falls, although in an ice dam emergency, it wouldn't be impossible to add in the winter as long as the section you put it on is mostly clear. De-ice cables can be mounted yourself, although most times wiring a circuit outside is required, and may need to be done professionally.